Showing results for tags 'masterliquid 240'. Just got round to trying to install MasterLiquid 240. 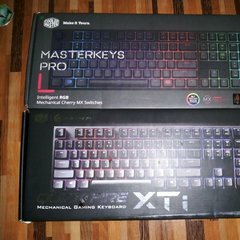 Hi, I just got around to trying to install the Cooler Master MasterLiquid 240 i got from Amazon in Late March 2018. I removed the old Wraith Spire cpu cooler and noticed that their is nothing to mount the new ML 240 To. I checked the packet and consulted the docs as per normal. Theirs little to no mention on how to mount this ML 240 onto my motherboard with a AM4 socket, just a single picture in the little foldout booklet. As per my picture , i have checked everything and i have put red circles around the holes on the motherboard where previous cooler was installed. I have connected brackets as per instructions onto the Cooler and checked to make sure it will mount. It will not mount. I`m not a dimwit , but i am perplexed as i think theirs something missing ?? some sort of bracket ? I heard something about a special bracket being needed for AM4 mounting ? Is this free of charge ? Thanks, Paul. Hi, so i have a master liquid 240 (not the lite version it wouldn't let me use the Mater Liquid forum) and i just put my PC back together after having to do some motherboard maintenance i put my cooler back on and when i first turned on my PC i heard this trickling noise coming from the block/pump area and it hasn't gone away its really concerning too. So what should i do? Should i just RMA it?